Excellent stay wanting for nothing. The hosts were very friendly and accommodating. A bit ore than I would wish to pay but average for this area owing to oil industry. 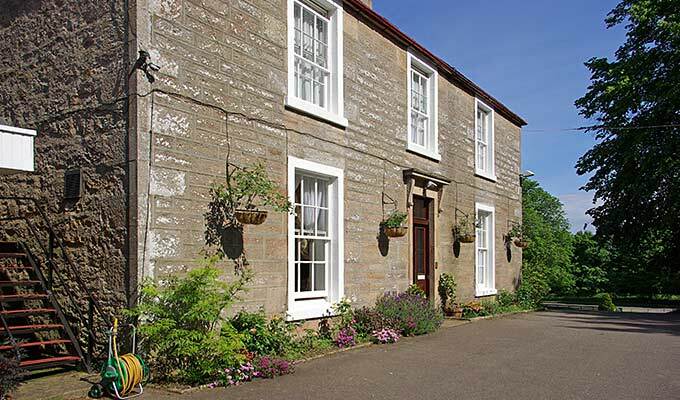 We had a very pleasant, one night stay at Morven House. Martin gave us a warm welcome, allowed us to store our bicycles in his garage, and gave us a good recommendation for dinner dining in Alness. Breakfast was tasty and filling. Morven House is easy to find on the main road into town. The service level and the welcoming from the owner couple was really great. You could feel how much they wanted you to enjoy the stay and they succeded. We stayed in nice rooms with high standards. The place was easy to find and there were lots of parking space. This was ideal for us passing through by bike on our way to John O'Groats. The room was huge and bathroom good with toiletries provided. The guest lounge was appreciated for after our meal and the breakfast was varied and of good quality. Martin provided a garage where we could keep our bikes overnight. Overall a good experience, thank you. Very warm welcome. Helpful with local information and places to eat. Good location within walking distance of town and set-back from road in own grounds. B&B facilities on the basic side. Great B&B. Lovely room with plenty of space & en-suite, wifi worked great. Well signposted from the road, and parking was easy. Martin was friendly & helpful - thank you! Very pleasant & helpful hosts, clean & comfortable room in a beautiful big house! Will stay again! Stayed 2 nights at Moven House, ideal location, nice big rooms, owners very friendly and made us feel very welcome, would recommend Morven House Guest House - 1st class with everything. Enjoyed my stay very much. Comfortable and cleverly-arranged en-suite room. Very friendly and helpful host. Excellent breakfast. Lovely setting and an excellent base for exploration. OK - in my opinion, overpriced as are almost all B&Bs in the UK but I suppose that there, $100 a night for a bed and let's not forget 'the FULL Scottish breakfast' might be good. Friendly, welcoming and cheerful hosts who helped with local info and directions. Beautiful grounds and setting with ample off road parking. En suite room clean, comfortable and compact as described and all facilities as advertised.How rare and pleasant to not have single supplement nor solo traveller to be charged double room rate. Cooked brekky choice large and uses local produce with plenty cereals, juices hot drinks etc. Small bar for evening relaxation in comfy lounge.... oh, and fabulous tweed handbags for sale in adjacent property. Great place with friendly owners. Peaceful location but close to Alness and the A9. Lovely room with lots of little extra touches. Very glad I found Morven House and will definitely stay again. I have to say what a lovely stay. Very pleasant welcome, a clean room and breakfast was all on time. After a long journey a very welcome stay. Fantastic visit. Martin cooks the best mushrooms on toast i have ever had. Loved every minute of out 3 day stay and cannot wait to visit again. Thank you very much for your friendly, attentive and professional service. The people were very nice the breakfast was very nice,and you could help yourself to cereals and the juice, on the whole it was. quite, and was handy if you wanted to go to Inverness, Dingwall, or Tain or Dunrobin Castle, would stay there again. Wonderful B&B, this was our first night's stay for a two week road trip round Scotland and what a way to start. The place was beautifully presented, friendly and welcoming. I would definatly stay again. All this and there is a nice pub just down the road! pleased to take a moment to recommend Morven House to any who are looking for a good B&B experience. Nice big rooms, friendly welcome and excellent breakfast. Comfortable, good breakfast, welcoming host. Recommend. Comfortable stay and evening meal availability very useful. Room was not 4 star standard. In need of updating and decorating. Shower cubicle/toilet ok prefer a bath, but to make matters worse sink was not in bathroom but tucked away behind door in bedroom not ideal. No central heating in our room just an oil heater. We were on ground floor Room No 6 and opened window at night and got an unwanted cat in our room. Breakfast was good, cooked as requested. I stayed in a single room, the smallest room in the house but although tiny it was perfectly adequate and even had a table and chair, something not often found in such places. Martin and Janet were very friendly and helpful. A big comfortable guests lounge also helps set Morven house apart from the run of the mill and the place has a residents license enabling one to have a quiet drink in if required. Should I have to return to Alness, this is the place I will be staying. Friendly atmosphere, nice breakfast. Room I stayed in was small but suitable to my needs. I was warned before hand that the room was quite compact. The other rooms are all very spacious and all have access to wifi. I would stay here again! We had a nice and pleasant stay. Very nice hosts. Very friendly owners who also kindly offered us breakfast earlier than the usual time. The communal areas of the guesthouse were very homely as well. All at a reasonable price. Just lovely- especially breakfast. Certainly better than most. We enjoyed our stay at the Guesthouse. Nice breakfast too! Excellent hospitality, the food and accomadation were superb....next time we are in the area, will definitely stay again. I stayed for one night during a long distance cycle ride. Our hosts made us very welcome and were very attentive and I would be delighted to return, if I am in the area again. I would happily recommend a stay at Morven House. We enjoyed a one night stayat Morvern House on our way home from a holiday even further north. The room was pleasant and well equipped, the breakfast was excellent. We were made very welcome. I stayed one night during a long distance cycle trip. The room and the bathroom were clean and comfortable and well equipped. The B & B is licenced which is a real bonus. I was offered the opportunity to get a take away in town and bring it back to eat in the dining room, which was a nice touch. I was made most welcome by Martin & Janet and breakfast was good. Good value for money. The proprietors were very welcoming, and the rooms comfortable and very clean. The location was most convenient, with easy parking, yet within walking distance of the main street and local walks. Arrived by bicycle, secure storage available in a locked garage. Very friendly, good sized room and decent food. This was our second stay at Morven House. Like the first visit, we found our hosts, Martin and Janet, efficient and friendly. The accommodation was clean and comfortable, taking the age of the property into consideration, and pleasantly situated. We have absolutely no problem in recommending this accommodation and fully intend to stay here again. We found Morven House well situated as a base to travel around Highland Scotland. Welcoming and reasonably comfortable. Very pleasant stay in a convenient location. Very friendly. Comfortable Rooms. Good Breakfast. After two weeks traveling round Scottland, we bought two handknitted pullovers at Morven. The best for next winter! the second time I have stayed here and both times I have been very impressed with the atmosphere and friendly owners who were very helpful and made us feel at home. Although the hosts were extremely helpful, the room was very small, and the bathroom needed a lot of work. The breakfast was very good. Alness is not a "tourist" town and not a good location for walking to restaurants, etc. We didn't know the location when we made the booking. I know the hosts are working on the guesthouse and I'm sure they will make a success of it. Absolutely brilliant experience. Immediately we felt at home and the cleanliness of the rooms was unparalleled even when compared to some 5 star hotels. Janet and Martin are very approachable and obviously put their all into the guesthouse. I could not recommend the guesthouse enough and will definately be returning, if it were a choice between this guesthouse and a hotel, this guesthouse would win every time. Well done! I stayed the night before my wedding and couldn't have asked for a better place to stay. My room was perfect and had everything I needed. Had a really nice breakfast which set me up for the day ahead. Everything was brilliant, even helped sorting our wedding suits out so we looked presentable for the big day. Will definitely be staying here again! We recently had the occasion to stay at the Morven and found it to be very comfortable and clean. Martin and Janet could not do enough for our party of 6. Nothing was a problem for them. The rooms were well equipped and the breakfast was plentiful, tasty and unrushed. We also made use of the beautiful guest lounge. I would not hesitate in recommending anyone to stay here.